The best thing about 2014 was our patrons, fans, and community. 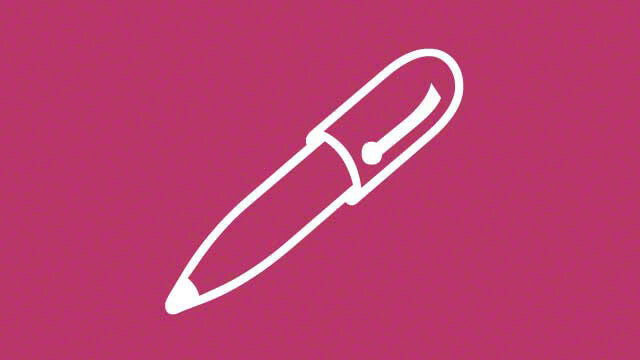 Your interest, comments, and support were creatively nourishing and inspiring. Thank You! 2014 was a good year, great outdoor shows, fun and engaging art projects, and a lot of commissioned works! 2015 promises to be even more exciting, as we have 3 art projects on the calendar, as well as several outdoor shows, a group show (and maybe another), and more… And it all kicks off with bang in the months of January and February. 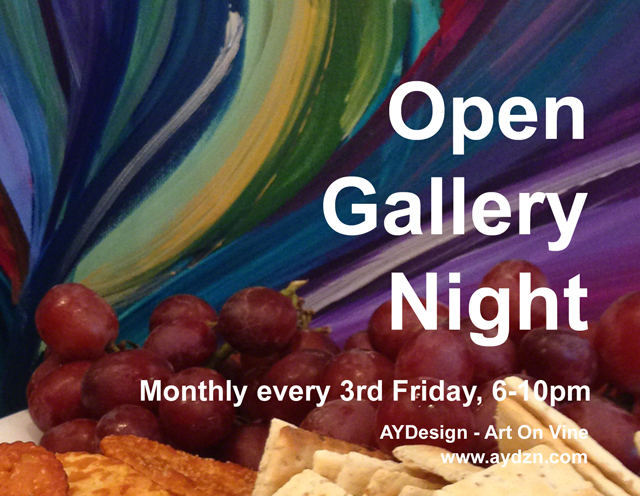 We are excited to announce a special group exhibit at AYDesign – Art On Vine gallery! 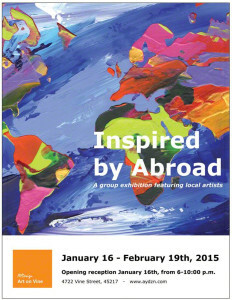 The “Inspired by Abroad” show will run from January 16, 2015 – February 19, 2015 with an opening reception, January 16th from 6-10:00 p.m. and features local artists Marion Corbin-Mayer, Gary Kessler, Emily Law, Jim Obergefell, and Amy Yosmali. The works are inspired are by the natural beauty, architecture, and cultural experience on our journeys abroad. 30 Paintings 30 Days – January 2015 Challenge! We really enjoyed participating in Leslie Saeta’s September 2014 30 Paintings 30 Days challenge with our “Fat Girl Thin” series that we have decided that we will be participating in the January 2015 challenge. We will be posting every day throughout the month of January a new painting. We have selected a theme that we think you will enjoy and can’t wait to share with you! 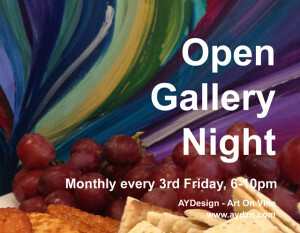 At the conclusion of this challenge we will have the works on display and for sale at the AYDesign – Art On Vine gallery during our February 20th, Open Gallery Night (6-10pm). Please feel free to like, comment and share our daily posts! • Commissioned artwork Commissioned pieces are a great way to capture a special memory such as a vacation, meaningful place, or unique colorful expression for your space. We require no money down (unless the painting is larger than 24”x30”), charge no more for the completed work than what I do for my other works, and most importantly, you do not have to buy it if you don’t like it! No portraits of people or pets. Yes to beautiful views, landmarks, inside jokes and memorable moments. A great idea for those who wish to gift a unique gift. 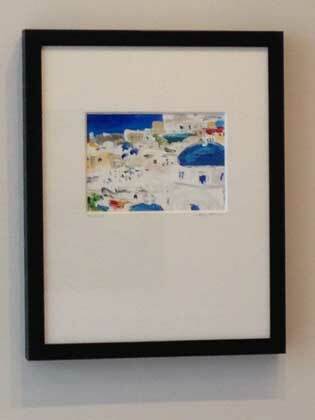 Matted and framed artwork start at $90* and up. Arrangements for commissioned artwork need to be made by January 26th, In order to receive commissioned works in time for Valentine’s Day. • Original artwork can make for a great gift for a special occasion. I once had a customer, as a surprise for his wife, purchase an original painting, he also purchased an Art Jewelry necklace featuring the same painting. Brilliant. Gift. Idea. • Art Jewelry An elegant piece of art that you can wear. Each beautiful necklace is made of Solid Sterling Silver, waterproof, and features an image of an original painting created by artist Amy Yosmali. PLEASE NOTE: Art Jewelry orders must be placed by January 17th in order to receive them in time for Valentine’s Day!